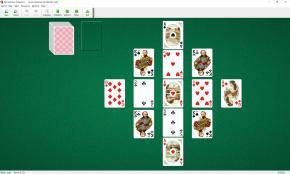 Dutch Windmill Solitaire uses 104 cards (2 decks). The Ace of Hearts is automatically moved to the center. Four black Kings are placed diagonally around the Ace. These 5 cards form the 5 foundation piles. 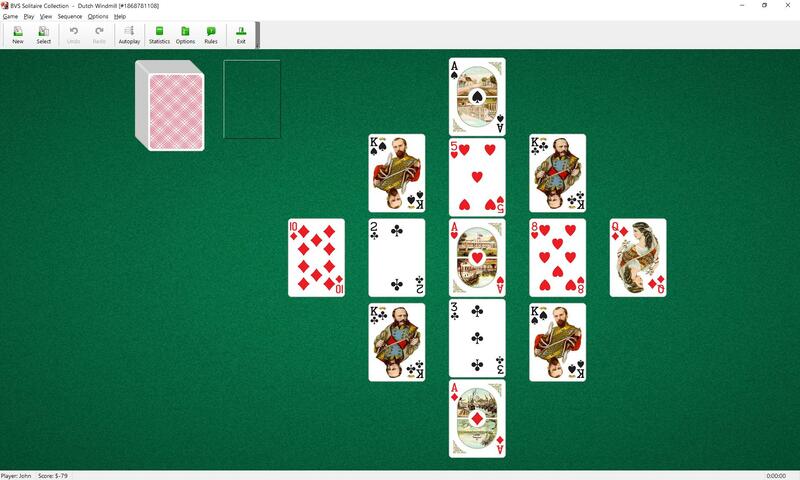 You also have 8 tableau piles (with one card per pile) placed on the board in the form of a cross. To build all cards on foundations. You must move 48 cards in order of rank (A, 2,3,...,K,A,2...) onto the Ace in the center, wrapping from Ace to King as necessary. You must move 13 cards in reverse order (K,Q,...,2,A) onto four Kings. Each tableau pile can contain only one card. The top card of the waste pile and cards in tableau piles are available to play on foundations. Spaces in tableaus are filled automatically from the waste or stock piles. When you have made all the moves initially available, begin turning over cards from the stock pile to the waste pile. The top card from any of the King foundations can be moved to the Ace foundation. It's obvious that you should do this only if it can help you to use another suitable card from the wings or the stock pile. You cannot move Kings from the King foundations.